A common name for three or four congregations of hermits living according to the rule of St. Augustine with supplementary regulations taken from St Jerome's writings. Their habit, or clothing, was white, with a black cloak. In the Roman Catholic Church, one of the great fathers of the early Christian Church whose major work was his translation of the Scriptures from Hebrew and Greek into Latin (which became the Vulgate); a saint and Doctor of the Church (347-420). A whole name. A word that names the whole of which a given word is a part ("hat" is a holonym for brim and crown). Also, a "tree" is a holonym of "bark", of "trunk", and of "limb"; plus, a "house" is a holonym of a room. 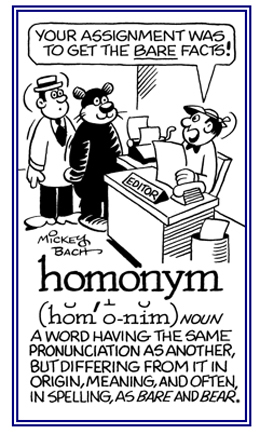 Holonymy is the opposite of meronymy. 1. A word which is identical with another one in pronunciation, but differing from it in spelling and meaning: Some examples of homonyms are fair and fare, read and reed. 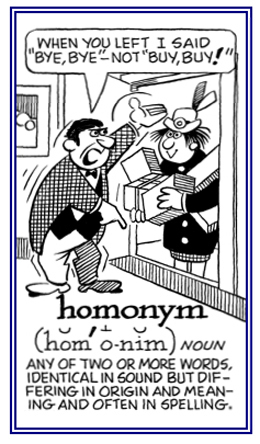 A homonym is also called a homophone and a homograph. 2. A word identical with another in spelling and pronunciation, but differing from it in origin and meaning: Two examples of homonyms which are spelled the same are butter, the food, and butter, one who butts. 3. The same name or word used to denote different things: The words bare, bear and bye, bye; buy, buy are examples of homonyms, as indicated in the cartoons below. 1. A word that is spelled or pronounced in the same way as one or more other words but has a different meaning. 2. Someone with the same name as another. 3. In biology, a taxonomic name that is the same as one already designating a different species or genus and cannot therefore be used. A name of a body of water or rivers, lakes, and oceanic elements. Proper names of bodies of water. Hydronymy is the study of hydronyms and of how bodies of water receive their names and how they are transmitted through history. It can apply to rivers, lakes, even oceanic elements. 1. The semantic relation of belonging to a higher rank or class; for example, superordination. 2. A superordinate word or a word that is more generic than a given word. A superordinate word is said to be an umbrella term: a word whose meaning encompasses the meaning of another more specific word; for example, "animal" is a superordinate of "dog"; in the relationship between "chair and furniture", "furniture" is a hypernym; in the relationship between "horse and animal", "animal" is a hypernym. Also, someone or something that is superior: someone or something of superior rank, status, or class. 1. A name made invalid by the lack of adequate contemporary description of the taxon it was intended to designate. 2. A term that denotes a subcategory of a more general class; such as, "chair" and "table" are hyponyms of furniture. A word that has a more specific meaning than another term; for example, in the relationship between woman and humans, "woman" is a hyponym; in the relationship between cat and animal, "cat" is a hyponym. Coined in 1963 by John Lyons, hyponym is supposed to describe an important notion which is central to the way we define meanings in terms of lexical structures. People often construct meanings in terms of a hierarchy of categories, ranging from the generic, technically called the hypernym, literally "the word above"; to a subsidiary or hyponym, literally, "the word below". "Cat" is a hyponym of animal, although all cats are animals, all animals are not cats. "French" is a hyponym of languages; and "square" is a hyponym of rectangle; also, the words "tulip" and "rose" are hyponyms of flower. Showing page 6 out of 13 pages of 184 main-word entries or main-word-entry groups.